CHICAGO (thefutoncritic.com) -- TV Guide will announce in its July 26 issue that "Stargate SG-1" has been picked up for an eighth season by Sci Fi Channel. The exclusive report was hyped in a press release by the magazine. 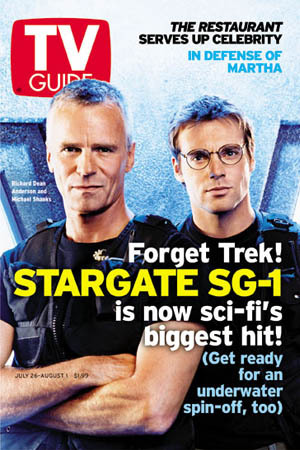 The issue, which will be available nationwide on Monday, features "SG-1" on the cover proclaiming "Forget Trek! Stargate SG-1 is now sci-fi's biggest hit!" The magazine will also provide details about the long-awaited spin-off series "Atlantis" as well as an interview with series star Richard Dean Anderson. The series, currently airing its seventh season, remains a monster success story for Sci Fi and is the network's most-watched program. Special thanks to the folks at Gateworld.net for the photo.